Millar Chiropractic Clinics specialize in Neck Pain treatment. We have developed tried and true protocols and treatments. In treating neck pain, experience does matter. And we have successfully treated thousands of patients with everything from a "little crick in the neck" to the worst cervical herniated disc. Call the neck pain specialist, Millar Chiropractic Clinics today for your Free* Consultation/Meeting. Like the above video says the most lasting Neck Pain Relief came from Chiropractic and Exercise. At Millar Chiropractic Clinics we give you both Chiropractic and Exercise together. It is an unfortunate fact of modern life, that most people will experience bouts of neck pain during their lifetime. We would like to present an overview of the basic anatomy involved, the symptoms that may be included, and the tools we use to help us properly diagnose your neck pain problem and determine which factors are causing and contributing to your neck pain. Also, and perhaps most importantly, we will briefly explain some of the things we can do to treat your neck pain and bring you lasting relief. 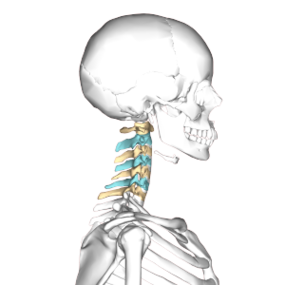 The seven cervical vertebrae normally form a curve, which can sometimes be disrupted due to traumatic injury or other causes. Restoring a proper cervical curve is often an important part of healing, resolving and preventing neck pain problems. In between each vertebra is an intervertebral disc, which is spongy connective tissue that acts as a cushion or shock absorber for your spine. These intervertebral discs also allow extra space between the vertebrae, so that your nerve roots (which are nerve bundles that branch off of your spinal cord and go to various parts of your body) have room to exit the spinal cord between the vertebral segments. This is one of the most important jobs of your cervical spine – protecting both your spinal cord and these nerve roots exiting between the segments. The cervical spine also supports the head, which is something of a natural engineering marvel, considering that an average human adult head weighs around ten or eleven pounds. Picture balancing a bowling ball on top of a stick, and you get an idea how amazing your neck really is. And it's not just holding up your head and balancing the forces of gravity that are working against it. A strong and healthy neck, in proper alignment, also allows for full range of motion of the neck and head. Every time you move your head – looking right and left, up and down etc. - various muscles, tendons and ligaments spring into action and work together to make your head movements possible. Neck pain often includes more than just tenderness in the neck area. 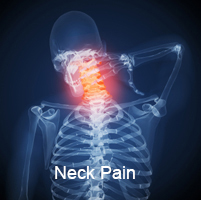 Muscle spasm and stiffness will very often accompany neck pain. Sometimes the muscle spasm and stiffness are your body's attempt to splint the area and limit range of motion, in an effort to protect the more vulnerable structures. In other cases, muscle spasm and stiffness may be the result of stress or muscle strain. In either case, the muscle spasm and stiffness tend to trigger even more pain and inflammation, resulting in a negative feedback loop which can be difficult to interrupt. Other symptoms may be present, including pain which radiates into the shoulder, arm, upper back and/or scapula (shoulder blade.) Neck pain that radiates tends to be more complicated to treat, compared to neck pain that is localized to just the neck area. 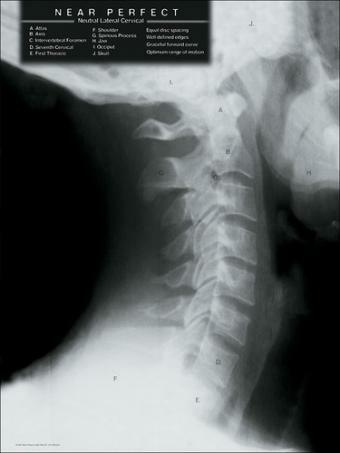 Sometimes pain will begin in the neck, and if the problem is not corrected, the pain may begin to radiate indicating a worsening of the condition. Like most health issues, prevention and early intervention and treatment will usually guarantee the best results. **This is very important: The symptoms associated with more serious causes of neck pain include arm weakness and arm numbness. If you are experiencing arm weakness and/or arm numbness, please do not wait to have the problem evaluated and treated. Neck pain can be caused by something obvious like injuries and trauma – for example, a fall or motor vehicle accident. stress - and last but not least, the one thing most of us have these days... stress! In order to make an accurate diagnosis, your Millar chiropractic physician will take a complete history and perform a thorough exam. Xrays are normally taken of the problem area. Sometimes additional scans and tests are needed to properly diagnosis the problem, such as MRIs, CT scans, and even blood work in some cases. Your Millar doctor will then discuss the chiropractic findings, answer your questions fully and present a treatment plan which is designed to both get you out of pain and keep you out of pain. Patients may also receive a number of additional therapies to help correct their problem. These may include therapies which help to reduce inflammation and promote muscle relaxation such as: manual therapy and massage; ultrasound; cold laser therapy; and e-stim – which uses gentle electrical stimulation to reduce inflammation and help relax the muscles. Decompression traction (DTS), may be indicated in some cases and is very effective in treating certain types of disc problems. We also prescribe specific exercises to stretch and strengthen the muscles involved. Phase three is the "Rehabilitation Phase" during which we create a custom rehabilitation plan with neck exercises customized for your particular neck problem. We start with where you are today, with goals of strengthening your muscles and improving your range of motion. This Custom Rehab program will help you enjoy a healthier and more pain free tomorrow. *Caution* - You may not be ready for neck exercises. Talk to your Millar Chiropractor first to find out if neck exercises are appropriate for you. If your neck is radiating pain, numbness, and/or weakness into your arm, forearm or hand, you need to see your Millar Chiropractor right away! Some neck pain symptoms can be related to other severe problems such as heart attack, stroke, infection, cancer etc. If your neck pain is of sudden onset without traumatic cause, then you should seek immediate medical care! If your chronic neck pain persists for more than three days, call Millar Chiropractic Clinics and schedule an appointment today at Toll Free 1-800-462-4476. Ask for your Free* Consultation/Meeting. Copyright 2017 Millar Chiropractic Clinics. All rights reserved.